I recently asked my mother to search through our old family photos to find pictures of us at Disney through the years. My family is from Florida, so even though we moved around a lot as children, we visited Florida and Disney on a regular basis. From childhood (I'm pretty sure the first time I went I was around 3) through high school, we went countless times, so finding these pictures shouldn't be too difficult. But, you may wonder why that number is countless. It's because there are no pictures anywhere. You see, I am the baby of 3 children. My older brother and sister are 7 and 9 years older than me. They might have pictures from their trips as children, but there are none (or very few) of me as a kid. Actually, the pictures that I took from a trip with my high school band (Magical Music Days - another post for another day) have mysteriously disappeared as well. Now, Disney has Photo Pass. Actually, this may have been around for a while, but we recently used it for the first time. You know those Cast Members with cameras all over the parks? They're located strategically all over the resort - from the specially themed meals (Hoop-dee-doo Revue and Cinderella's Royal Table) to views on Main Street with the Castle in the background, or at Epcot with the Spaceship Earth Geosphere in the background. Basically, they're everywhere. And, if you want, they will take your picture with your camera as well, or simply take the picture and assign it to a card. Take this photopass card with you to all Character Meet and Greets, dinners, etc... even on rides now. With the Photo Pass system, you can have an unlimited amount of pictures taken (pictures are unlimited, the cost isn't) and then review them when you're at home. Plus, then online, you can add borders and messages such as "First trip" or the date. 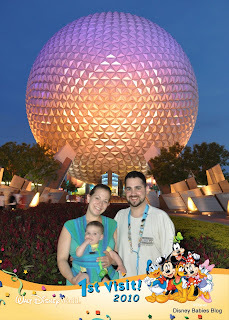 Noah's first trip and our favorite photo op! For a set price, you can get a cd with each picture taken on it. The price is hefty (over $100, but look for deals! ), but if you record every single ride shot, get pictures taken everywhere, and actually like a few of them, it may be worth the cost. And, your children will one day appreciate having the photos! I can't promise that we'll get the "1st visit" picture for every child (we do plan to eventually have another). That's too far in the future to predict right now, but I can guarantee that we'll make the Photo Pass investment again in the future. Talk about a souvenir for posterity! Do you have a favorite picture opportunity in the parks?